Metapad has long been one of my favorite text editors. I just noticed there's a new version out, and one of the cool new features is full USB portability. Just create a blank file called metapad.ini in the application folder and it's ready to go. Yes, you are right, version 3.6 is portable if you create the "metapad.ini". Metapad 3.6 final has been released. What is "dirty file notification"? webfork wrote: What is "dirty file notification"? Topic update: the present is now the official forum topic for Metapad (http://www.portablefreeware.com/?id=2108). 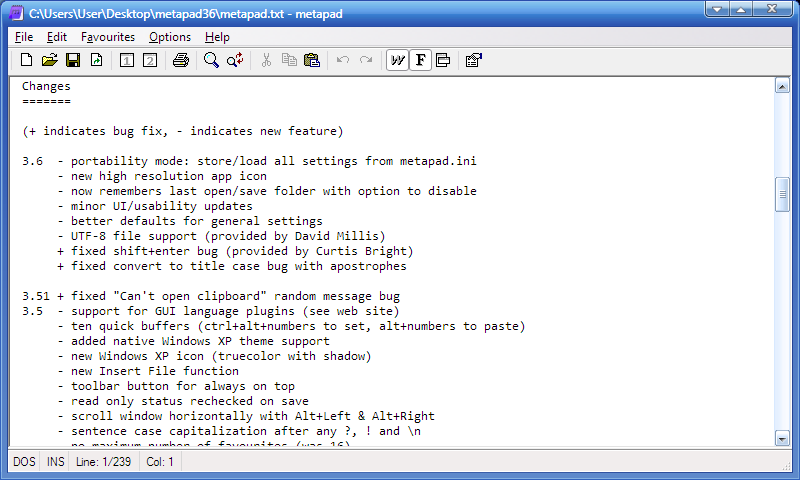 [url]http://liquidninja.com/metapad/[/url] author wrote: Metapad is a small, fast and completely free text editor for Windows (95/98/NT/XP/Vista/7) with similar features to Microsoft Notepad but with many extra (and rather useful) features. It was designed to completely replace Notepad since it includes all of Notepad's features and much, much more. The last release (v3.6) has made Metapad entirely portable and stealth (tested under Windows 7 x64 SP1): see the official info at http://liquidninja.com/announcing-metapad-3-6/. Metapad latest release can be downloaded from http://liquidninja.com/metapad/download.html.